Let us organise your group trip for you! We've got the best deals, local guides and itineraries to make this trip one you'll never forget. Hike through 5 different ecosystems, find a level of fitness you never knew you had and reach a state of mind you never knew you could. Kilimanjaro is the highest free-standing mountain in the world. The peak is at a height of 5895 metres. The trek will take 7 days. Climbing Kilimanjaro marks an incredible personal accomplishment. The event is significant enough that every year dozens of local newspapers write the story of a town resident who makes the journey to the peak. Write your own story and scribe it with an adventure of a lifetime! The phrase 'I feel like I'm on top of the world' actually comes true and the feeling is indescribable. Standing on the roof of Africa while looking down at the rolling clouds beneath you among the glistening glaciers is a sight you'll hold close to your heart forever. See things you can't see anywhere else on the planet - Kilimanjaro's high altitudes have created habitat for strange and unique life forms found only on a few other peaks on the planet. Go now before it changes forever! Kilimanjaro is a hot spot for studying climate change scientists predict its glaciers will be gone in the next 10-15 years. Kilimanjaro inspired a continent to freedom; Tanzania was the first African nation to win independence. As well as the personal benefits, you will be helping to raise valuable funds and leave a positive footprint in Tanzania. We will be partnering with the Born Free Foundation for this climb who will give all of us coverage and the spotlight in their magazines and associated press pieces. Climbing Mount Kilimanjaro is one of the most breathtaking and awe-inspiring activities you will undertake in your life. Scaling the tallest free-standing mountain in the world, a stone's throw from the birthplace of our species, this is an adventure packed with exotic excitement, laced with adrenaline and topped with a lifetime of memories and stories to take away as an invaluable memento. After a gradual ascend through the rainforest you emerge to see wide views of the moorland and the vast sways of spectacular landscape. You'll see the Lava Tower, the Shira Plateau and the Great Barranco wall among other wonderful features along the way. The final hike to the summit takes place in arctic conditions and you will pass the spot of the famous 'frozen leopard' - a good time to take a selfie or two. Did you know? The snow at the peak of Kilimanjaro is melting away due to global warming and this might be one of the last opportunities to experience it in its original and natural form. 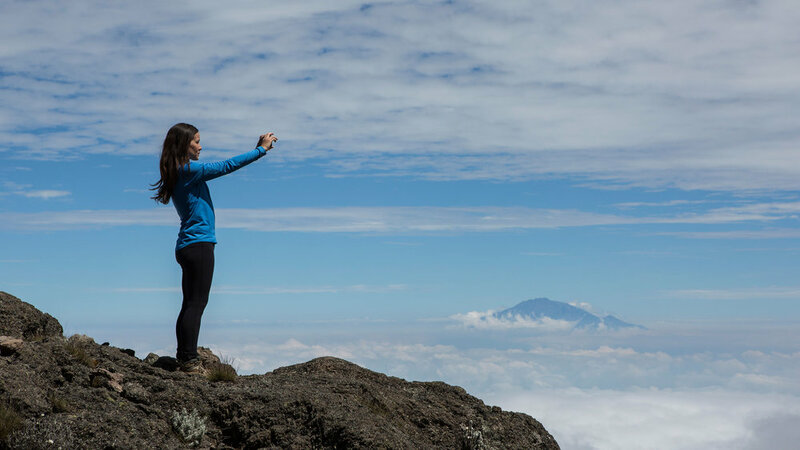 When you first arrive in Tanzania and make your way towards the mountain, you will be greeted by our team at the Mountain Inn hotel at the feet of Kilimanjaro where our XP Club members will be getting acquainted and you will be given a full briefing on the forthcoming activities. For a full, detailed itinerary of the hike please download the guide below. After descending the mountain on day 7, you will be taken back to the hotel in Moshi. In the evening, The XP Club members will unite at the hotel for a final time to celebrate with a memorable closing party. -Short flight to the neighbouring paradise island of Zanzibar. The XP Club founders will be doing all of these things and if you wish to join us please get in touch as we can arrange as part of the package.